So you want to be able call from any standards based video conferencing system from say your Skype for Business that may be hosted in Office 365. With Pexip Infinity, this can be hosted in Microsoft Azure as an example and the below guide shows you how simple registering H323 devices is. Registering H323 Devices to Pexip involves a few steps. Step Five – Outside the network? Firstly navigate to the Pexip Infinity Manager and head to Service Configuration > Device Alias. Just click on Add Device Alias and then enter the required numerical alias ID. When creating an E.164 alias, this has to be numerical as shown below. Next we need to create another URI alias so that we can dial this H.323 device via say Skype for Business. Same process, just add a new alias, but this time adding in the domain name. Make sure the username and password matches the above E.164 alias in the previous step. Now we will see our two entries in the Device Alias list. The next step will allow anyone call these registered devices. You need to create a separate rule per protocol you enabling, so in my case with my registered rules, I have created two, one for SIP and one for H.323. 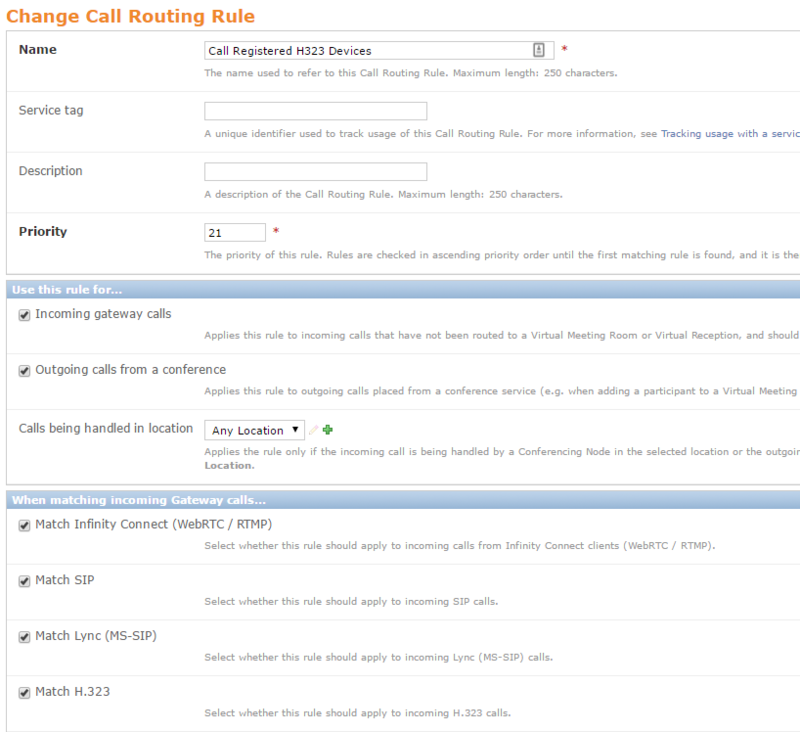 Navigate to Service Configuration > Call Routing and click Add Call Routing Rule. 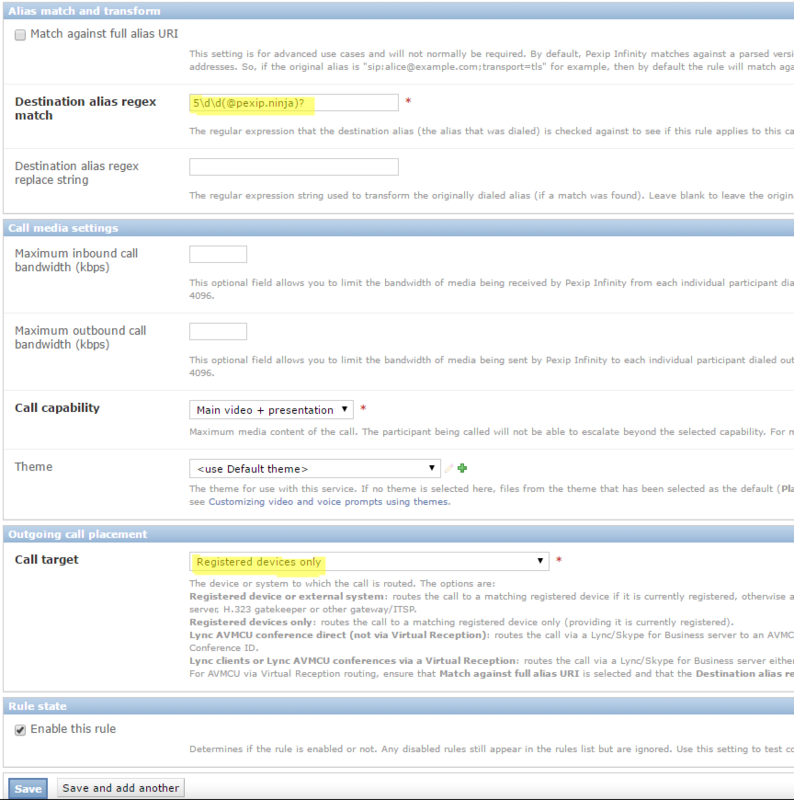 (If you do not see Call Routing but see Distributed Gateway, you are running version 11 or lower). Distributed Gateway was renamed to Call Routing in v12 onwards. Now just enter the required details matching your domain name settings you have within your Pexip platform. 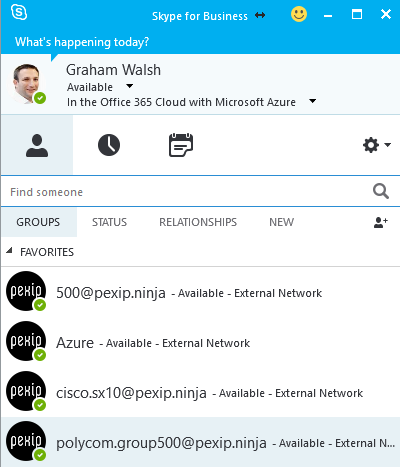 As you will see in the below section, just enter what you want to dial, so from my Skype for Business client, I will dial 500@pexip.ninja which will route to my Polycom Group Series using H.323 protocol. As you can see, I have narrowed down what can be dialled so that you ensure only numbers beginning with 5 will be routed using this rule. Also, make sure you select the right protocol for this rule. 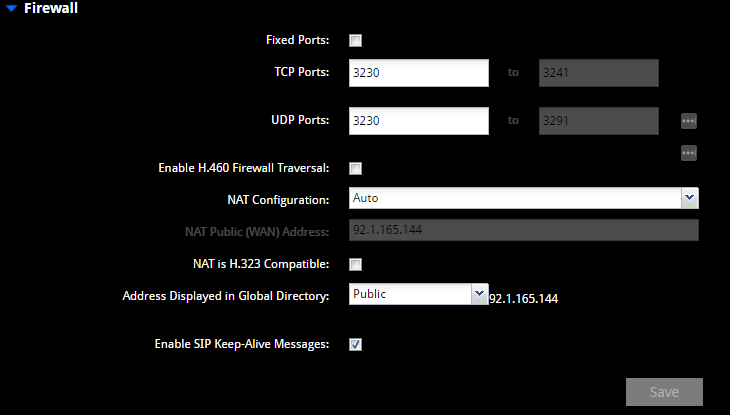 As you can see below, I have exactly the same rule created, but with the Outgoing protocol selected as SIP, so I can dial using with either alias I have setup. Now we need to input these settings into your H.323 system. I am using a Polycom Group Series on 5.1.2 software. Log into your Group Series using a web browser and head to Admin Settings > Network > IP Network. In the H.323 section, Enable H.323. Then enter the details that you inputted into the Pexip Infinity platform to match here on the Group Series. If everything is ok, you will the Registration Status change to Registered once you click save. The primary Gatekeeper address is the DNS (or IP) and a conference node or pool of nodes. If the endpoint is not on the LAN or same network as the Pexip server, you can tell the Polycom as an example to publish it’s IP addresses rather than the private IP as Pexip does not support H.460 today. 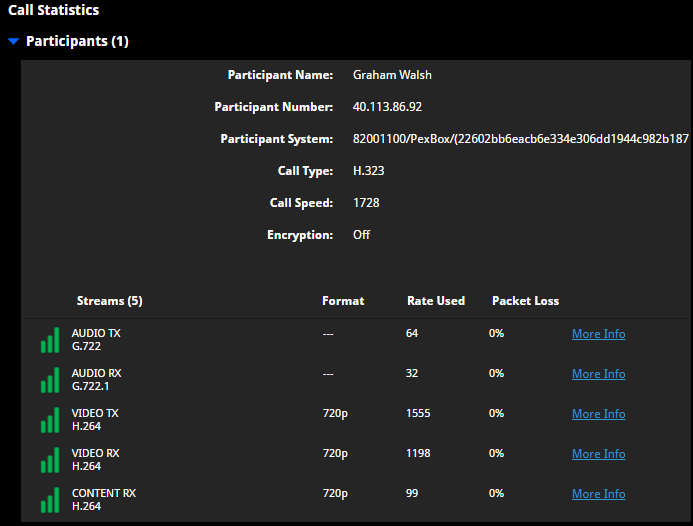 As an example here, my Polycom sits on a 192.168.1.x address being my ISP router. My Pexip platform resides in the Microsoft Azure cloud, so nowhere near it or even on the same network. In the Polycom Group Series just head to Admin Settings > Network > IP Network > Firewall and select the options as shown below. This will most likely be required for SIP registrations too, to best to enable as above. 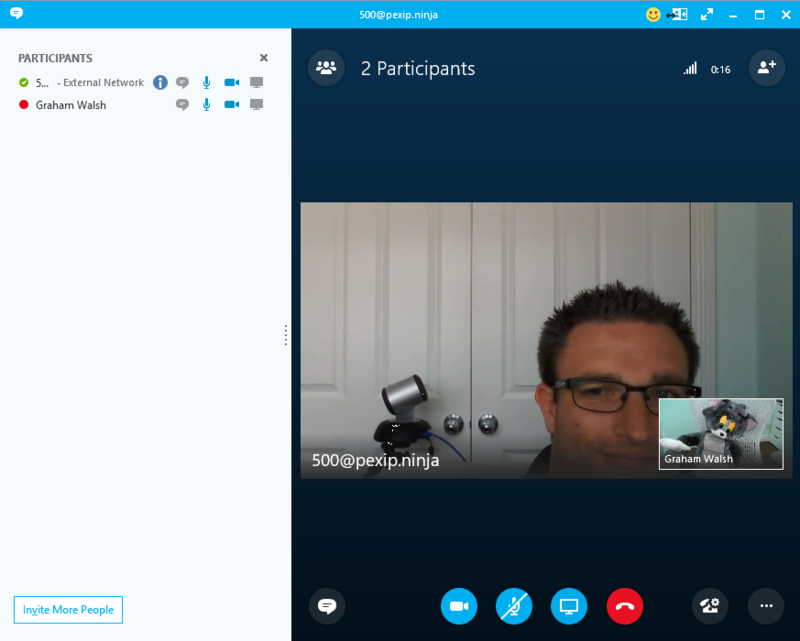 Now that you have enabled everything and the system is registered, I can type in 500@pexip.ninja into my Office 365 Skype for Business user and dial the Polycom Group Series using either SIP or H.323. Then simply right click on the entry you want to call and choose Start a Video Call. Skype for Business will then route the call to Pexip Infinity and Pexip will dial to the registered device. 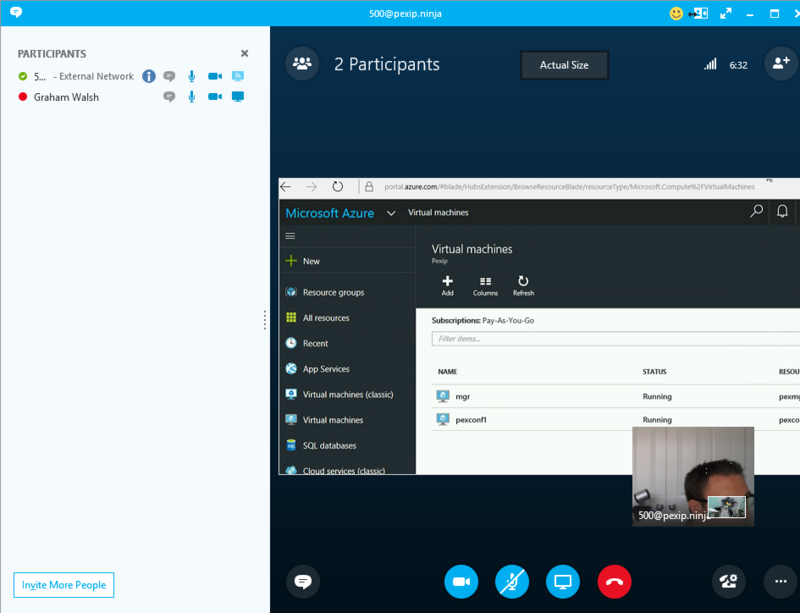 You can then share content from either Skype for Business or from the Polycom as you normally would. 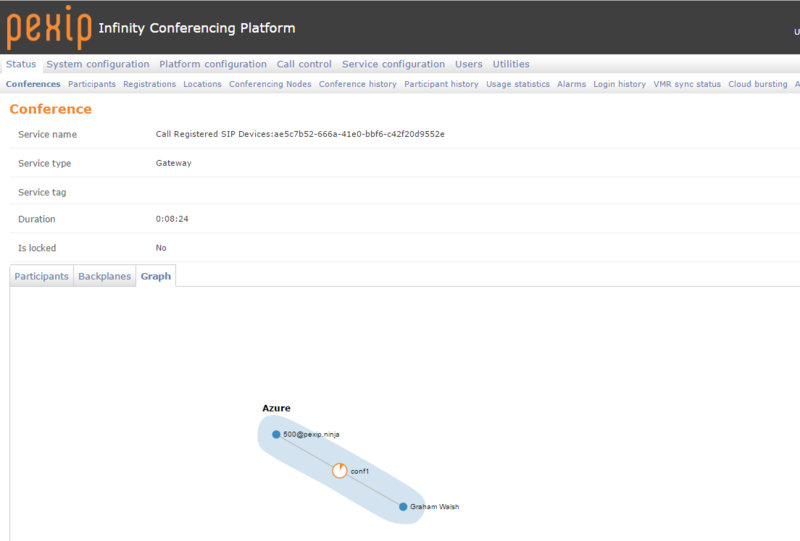 Finally, in Pexip, you can see the call in action and see all the stats and a nice overview of the call. Hope you enjoyed this article, please feel free to ask any questions.